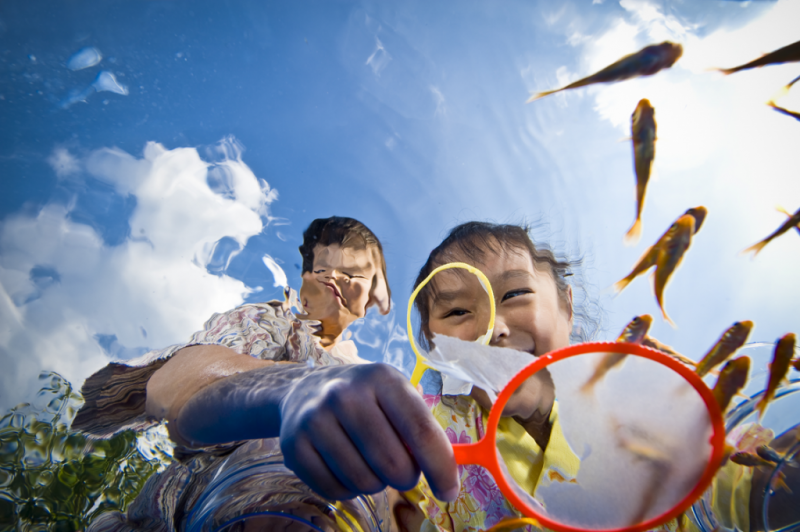 Goldfish scooping, a traditional summer festival activity in Japan, demonstrates the juxtaposition of the goldfish’s battle and children’s play. By taking the perspective of water, the perspective shifts from the laughing children to the desperate fish under the such hot summer. A specially made acrylic plate was used to capture this unique perspective. Born 1958 in Japan, I have worked in child portraiture studio for years. My style is to introduce the world of children, their natural expressions and energy through my photographs. I am deeply moved to show the vivid expressions when they challenge themselves with all that is new and adventurous. Unconsciously, through this series of moments, the children are growing up. A Grand-prize Minister of the Ministry of Education, Culture, Sports, Science & Technology winner in 2009, four time winner of the APA Award by the Japan Advertising Photographers’ Association. Winner of the JPS Award by the Japan Professional Photographers Society. Private exhibition 2010 in New York at the Nippon Club, Supported by the Consulate-General of Japan in New York. A special lecturer at the Nikon College Sponsored by the Nikon Corporation.